A crowd of more than 400 people applauds the designs created by Pearl Beavers for her collection, Home Sweet Home. Photo by David J. Hawkins. 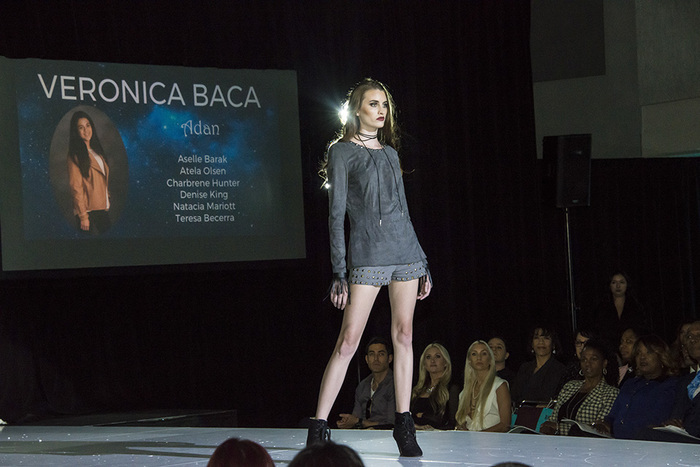 A model strikes a pose while showcasing a piece from senior designer Veronica Baca's collection Adan. Photo by David J. Hawkins. Model Jonas Macromallis walks in senior designer Kenia Gomez's piece from her collection Demian: To Tame. Photo by David J. Hawkins. The dress this model is wearing comes from the winning collection, Fashion Collection, by senior designer Yvette Alexis Mendoza. Photo by David J. Hawkins. Models display the collection by Ani Torosyan, Potpourri. 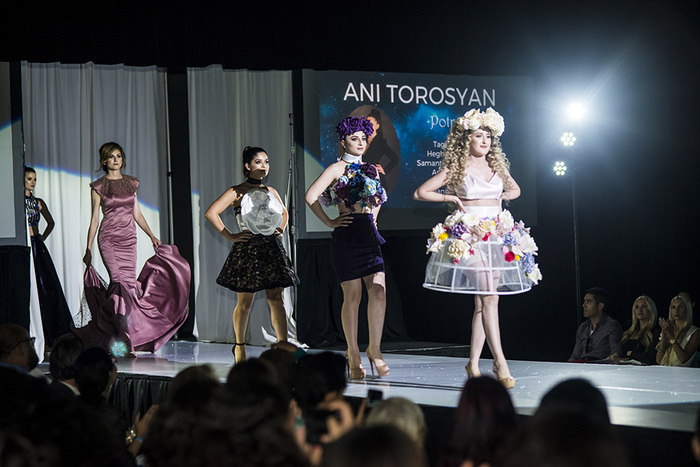 Torosyan's collection won second place at this year's Fashion Show. Photo by David J. Hawkins. A model reveals the first piece from Ann-Marie Navarro's collection Bewitched. Photo by David J. Hawkins. A tiny model displays the designs by apparel design and merchandising graduate students in a special presentation. Photo by David J. Hawkins. The design this model is wearing comes from an avant-garde collection by Eunju Kim, inspired by the global water crisis. Photo by David J. Hawkins. All-female Japanese dance team, NADESHIKO, kicked off the show with a dance performance. Photo by David J. Hawkins. Models who showed off Eleni Skiani's collection, The Socialite, applaud as they take a final walk down the runway. Photo by David J. Hawkins. One of many pieces by an "upcoming designer" from the pattern making and advanced construction classes. Photo by David J. Hawkins. 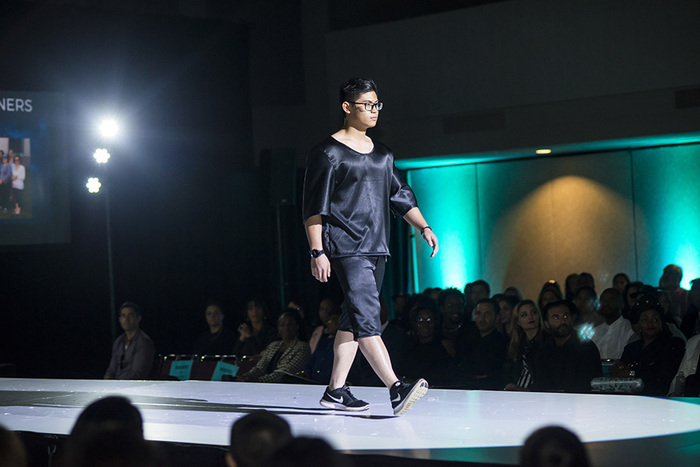 Transcendent: Beyond the Ordinary, the 38th annual TRENDS Fashion Show, took place on May 7 at California State University, Northridge in front of an audience totaling more than 400 attendees. The event kicked off with a dancing performance by NADESHIKO, an all-female Japanese dance crew. 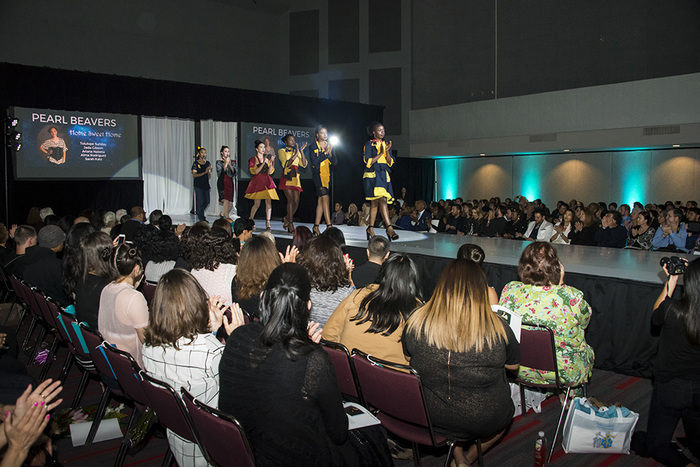 After the performance, the graduating senior designers showcased their collections, and apparel design and merchandising graduate students put together a special presentation. Future designers, students from the Advanced Construction and Pattern Making classes, also designed garments which were featured on the catwalk. The fashion show, organized as a contest for the graduating seniors in apparel design and merchandising, awarded three winners who were judged on creativity, pattern and construction and trend awareness and marketability. Ani Torosyan garnered second place for her collection, Potpurri. According to Torosyan, the collection consisted “of different types of 3-D faux and hand-constructed flowers, flower prints and beading.” Torosyan aimed to portray romance and femininity in her designs. First place was awarded to Fashion Collection by Yvette Alexis Mendoza, an apparel design and merchandising major graduating at this year’s commencement. Mendoza said winning first place not only brought her joy, but also validated her hard work and reinforced her decision to change her major. Shirley Warren, an apparel design and merchandising lecturer and the show’s producer, said she’s proud of apparel design and merchandising students for putting together a great show. Chair of the Department of Family and Consumer Sciences Tom Cai was proud of all of the student-designers and other students who helped put together the show, as well as the faculty members who mentor the apparel design and merchandising students. 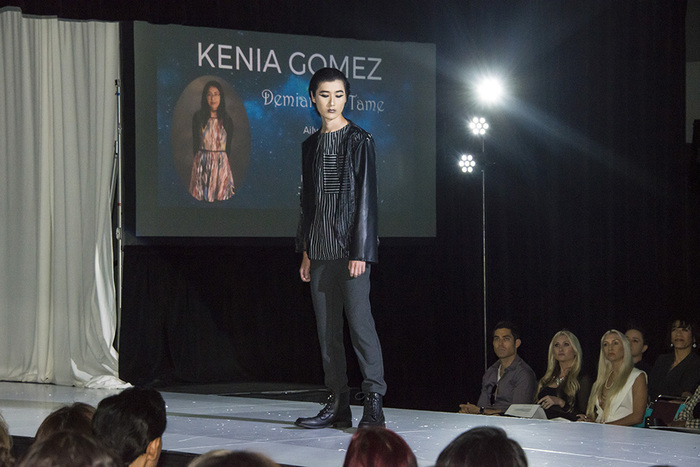 “The Fashion Show is one of the most glamorous student events on campus,” Cai said. “It is planned and organized by our very talented students, who have great potential in contributing to the campus and community.